Al-Jazeera TV reported that an agreement was reached between Israel and Hamas on a cease-fire in the Gaza Strip. The agreement was reportedly obtained by Egyptian mediation. On Tuesday afternoon, Hamas leader Ismail Haniyeh spoke publicly about the wave of escalation in the south. "If Israel stops its aggression, it will be possible to return to the understandings of the cease-fire." Haniyeh added, "The resistance defended its people and themselves against Israeli aggression, and the Palestinian people, as usual, adopted the resistance with patience and pride." Meanwhile, the cabinet ministers concluded a seven-hour meeting Tuesday afternoon during which the discussed the security escalation in southern Israel. "The Cabinet discussed the events in the south and heard reports from the IDF and the security forces about the attacks and the widespread actions against the terrorist elements in Gaza. The cabinet instructed the IDF to continue operations as necessary." A political source said tonight that Hamas had approached Israel through four different intermediaries and asked for a ceasefire. Israel responded that the steps in the field would be determined on the basis of need and that Israel reserved freedom of action. 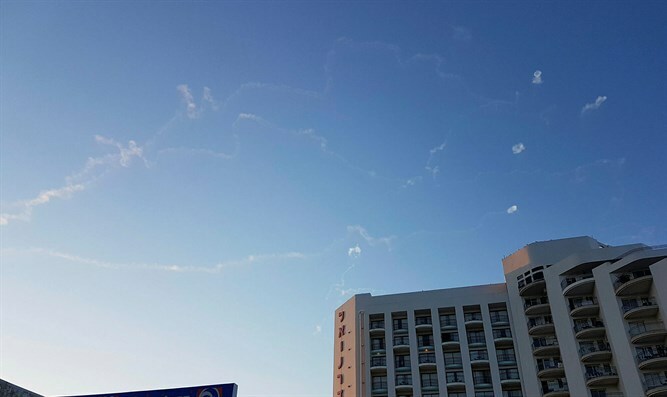 More than 400 rockets and mortar shells were launched at between 16:30 on Monday to Tuesday afternoon. By 9:00 AM, 55 Israeli casualties were reported, including a 48-year-old man who was killed. Four people were seriously injured: a soldier wounded by shrapnel in the Sha'ar Hanegev section, two women aged 60 and 40, and a 40-year-old man. Twenty-three people are in light condition after being injured by shrapnel from glass, smoke inhalation, or were injured when running to seek shelter from the rocket fire. 27 people have been treated for shock.